As part of World Climate Week, Climate Interactive is giving the floor to the amazing people who make up the World Climate Community. 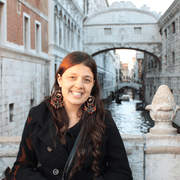 Below is the story of Dr. Carla N. Gulizia, Researcher at the Center for Atmospheric and Ocean Research in Buenos Aires, Argentina. I learned about Climate Interactive in 2013 when I was assigned as a Professor Assistant on a climate change course at the University of Buenos Aires. To prepare, I started googling innovative activities for my course. Since then, I have held the World Climate Exercise within this climate change course twice (2013, 2015). Since I had 15-20 participants in my course, I decided to use the 3-region version of World Climate using C-Learn for the event. 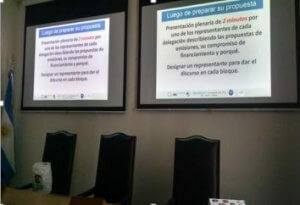 The events were attended by undergraduate, as well as postgraduate students in Atmospheric Sciences from the University of Buenos Aires, so they mainly had a scientific background. The last World Climate event I coordinated was held on September 22nd, at the National Academy for Exact, Physical and Natural Science, in Buenos Aires, Argentina as part of the XIV National Week of Science, Technology and Scientific Art sponsored by the National Ministry of Science, Technology and Productive Innovation (MinCyT). There were around 20 participants, so I prepared World Climate once again using the 3-region version of C-Learn. I began with a general lecture focusing on the physical basis to understand the greenhouse gas effect, the scientific evidence and observations on climate change, its causes and impacts, as well as future projections. After that, I began the World Climate Simulation itself. We didn’t have many resources, and the room was not set up in advance, but we managed to divide groups by moving chairs and there were very productive and fruitful discussions. Because of time limitations we were able to do only two rounds of negotiations. The first one resulted in a 3.5°C warming. Developed nations efforts focused in putting the maximum capacity of afforestation but there was little commitment in funding the less developed or developing nations. The first round was dominated by low commitment from all nations. None of them would commit to reduce their fossil fuels emissions without being sure that the others would make this effort too. In the first round there were no discussions between the three groups. After seeing the results of their first input, they started the second round and negotiated with the different groups. They tried to deal with the individual conditional compromises, which resulted in interesting discussions. Finally, and surprisingly, they were able to reach the main goal of no more than 2°C warming. This last result was never achieved in the other two World Climate Events that I organized in 2013 and 2015, so the ‘pessimistic feeling’ that my university students had at the end of the event was not the same here. 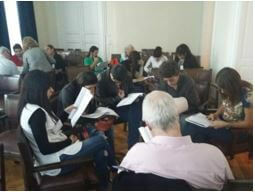 Participants felt that with fruitful discussions they were able to achieve the main goal. In the debrief session, we talked about individual actions that could be made to start reducing emissions. We also discussed the importance to spread this knowledge to our own students and people around us, to change people minds and raising awareness about the harmful consequences of climate change if no mitigation actions are taken to reduce global warming. The participants’ feedback were very inspiring. They showed great motivation and told me they were planning, or at least trying to plan, to repeat this kind of exercise in their own classes in middle and high schools.